Are you looking to learn new or enhance your arts and crafts skills? Want to meet and share your joy for the arts and crafts with like-minded friends. 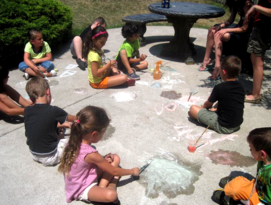 Whether you are an adult or a child, at the Gibson Gallery Fort Malden Guild of Arts & Crafts, we have passionate and qualified instructors with years of experience in a variety of mediums to help you reach your artistic goals. The Gibson Gallery is home to the Gibson Girls, the Wednesday Afternoon Guild, the Heritage Quilters and the Artist Station. 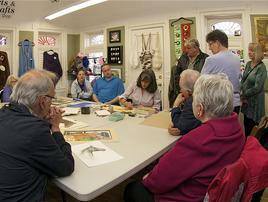 These informal guilds meet to share and enjoy their common love of the needle arts. The Gallery's activity room offers terrific lighting and table space for working and a great ambiance for conversation and friendship. New members are always welcome. Please contact the Gallery for more information. The Gibson Gallery is home to the Gibson Girls Needlework Guild. Various projects are taught and displayed. Examples of completed works include cross-stitch, needlepoint, Bargello, crewel embroidery, silk and gold thread, pull and drawn thread, black work, bead work, ribbon embroidery and hardanger. 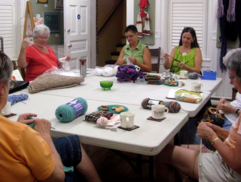 The Needlework guild meets Tuesday mornings from 10 am to 12 pm. These ladies are knitters, crocheters, sewers, cross-stichers, needle pointers, or anything that has to do with a needle. Their experience allows them to help out others. The ladies also help out many local charities such as the Community Center in Amherstburg, the Hiatus House and The Richmond Nursing home. The Wednesday Group meets every week from 1pm to 3:30pm. The cost each week is $1.00. The Artist Station is a guild open to all members of the Gallery who desire a relaxing, inviting, well lit atmosphere to create their artwork. Novice or professional-all are welcome. They meet each Thursday afternoon from 1pm-4pm. The cost is $1.00.